Since the Great Recession, GDP has still not returned to its pre-crisis trend. In the US, per capita output has fallen 10–15% behind the level implied by any reasonable estimate of a pre-crisis trend line. After a sharp decline in economic activity during the 2008-2009 crisis, annual growth was less than 2.5% on average, less than the growth in the years prior to the crisis, and nowhere near the rate of growth needed to recover from the output decline. The UK’s experience has been similar, while growth in the Eurozone has even stagnated since the crisis (see Figure 1). This lack of mean reversion in GDP is not unique to the Global Crisis. Over the past 50 years, financial crises have exhibited a consistent pattern of long-term losses to GDP that do not seem to disappear over time (Cerra and Saxena 2008, Teulings and Zubanov 2014). When total factor productivity (TFP) growth is exogenous, financial crises can be expected to have only transitory effects on the level of output. This column seeks to explain why a financial crisis might lead to a permanent loss in output. How can the effect of financial crises be so persistent? Recently, economists have hypothesised that the Global Crisis could have endogenously lowered the rate of technological progress. Endogenous growth theory suggests that the long-term trend in growth is due to profit-maximising investments in productivity-enhancing R&D. If a financial crisis causes a large temporary decline in these investments, it could cause a temporary reduction in technological progress. This then results in a permanent decline in the level of TFP. The macroeconomic evidence lends support for this – Figure 2 shows that productivity-enhancing investments declined sharply in 2008 and 2009, while growth in total factor productivity only slowed after 2010. Note: Left panel shows log of TFP, OECD data. Right panel shows log of intangible investments from INTAN-INVEST. The dashed line is estimated intangible investments from a sample of Compustat firms in De Ridder (2016). For overlapping years 2000-2010 the correlation coefficient between both series is 0.93. The academic literature offers various reasons for the decline in investment in R&D during the Global Crisis. Recent work claims that the crisis has affected productivity-enhancing investments through demand. Anzoategui et al. (2016) show that low productivity growth in recent years can be explained endogenously by lower rates of technology adoption due to lower prices of goods. Credit rationing limits the availability of capital in the short-run, raising the short run internal cost of capital for a firm. The physical and working capital has a higher short run return than investment in R&D. Hence, investment in R&D is postponed (Aghion et al. 2010). Moreover, banks may be less willing to facilitate investments in R&D because of its poor collateral value (Garcia-Macia 2015). These theories sound intuitive. But are these explanations true? The Global Crisis provides a natural experiment with which to test the endogenous growth hypothesis. If it holds true, firms with greater exposure to the financial crisis should invest less in intangible capital, temporarily reducing TFP growth, leading to a permanently lower level of output. To test this, De Ridder (2016) uses the fact that many firms have a preferred bank on which they rely for their supply of credit. This preferred bank is best informed about the details of the firm and is therefore in the best position to judge the creditworthiness of the firm. If the preferred bank of a firm is credit-constrained by large losses in other parts of its portfolio, the firm’s access to credit is blocked. This is most acutely felt in long-term investments in R&D, which affects the future growth of the firm. Following Chodorow-Reich (2014), the extent to which a bank is credit-constraint is derived from the risk composition of its asset portfolio, as well as the extent to which it was hit by the bankruptcy of Lehman Brothers. We use the exposure of a firm’s preferred bank to the financial crisis as an instrument for credit availability. For each standard deviation decline in bank performance, the intensity of a firm’s investment in productivity enhancement falls by around two percentage points. Figure 3 plots the effect over time for the quality of a bank’s assets, derived from its asset distribution across Basel I risk weights. Note: Effect of bank’s asset quality on firm’s intensity of R&D investments; 90% confidence bounds in green. The effect of these investments on output is plotted in Figure 4. Firms with preferred banks that were differently affected by the crisis enjoyed similar growth rates prior to the crisis. Interestingly, the recession of 2008 affected both groups of firms equally, and the initial recovery was also similar. However, the output of firms of which the preferred bank was heavily affected by the crisis started to lag behind their competitors from 2010 onwards, some two to three years after the credit shock. This is a plausible time lag for the effect of reduced R&D on productivity. For each percentage point decline in the intensity of investment in R&D and intangible capital, output declined by 1.3 percentage points between 2010 and 2014. Alternative forms of investments, particularly in physical capital, also decline during the crisis, but have no effect on output in the medium run. 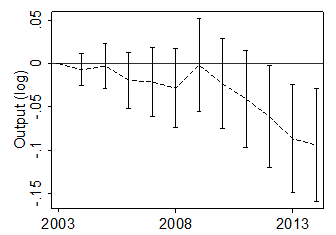 These firm-level estimates imply that if productivity-enhancing investments had been at the pre-crisis rate between 2008 and 2010, GDP would have been between 3–4% higher, which implies that the endogenous growth hypothesis explains roughly a third of the gap between current GDP and its pre-crisis trend. Note: Effect of one standard deviation shock in R&D during the Global Financial Crisis on output. Estimates control for changes in labor and physical capital, as well as firm characteristics. The strong effect of the crisis on the investment in R&D is consistent with the high return to R&D that has been reported in many studies, as surveyed by Hall et al. (2009). When the funding of these investments is problematic – due to their low collateral value, high uncertainty, and information asymmetry between creditor and debtor – marginal projects do not get funded and hence the return on the marginal R&D project exceeds the return on investment in working capital. Since the crisis, the view that a fast-growing financial sector negatively affects productivity growth has become popular (e.g. Cecchetti and Kharroubi 2012). Growth in the financial sector harms growth, for example, by taking up resources that might otherwise have been invested in the ‘real’ economy. Developments after 2010 suggest that the opposite is true. Policies to rapidly reduce the size of the financial sector during the crisis are more likely to have harmed than fostered growth. Such policies further tighten a firm’s access to credit, and hence its ability to fund investment in R&D, thus worsening the long-term effect of the crisis. The beneficial effects of freeing up resources for other sectors are dominated by the general reduction of investments in R&D. A better policy would be to restore the banks’ balance sheets so that borrowing to firms with high return R&D projects resumes as soon as possible. Aghion, P, G-M Angeletos, A Banerjee and K Manova (2010), “Volatility and growth: Credit constraints and the composition of investment”, Journal of Monetary Economics 57(3): 246–265. Anzoategui, D, D Comin, M Gertler and J Martinez (2016), “Endogenous technology adoption and R&D as sources of business cycle persistence”, NBER, Working Papers 22005. Cecchetti, S and E Kharroubi (2012), “Reassessing the impact of finance on growth”, BIS, Working Paper 381. Cerra, V and S C Saxena (2008), “Growth dynamics: The myth of economic recovery”, American Economic Review 98(1): 439–57. Chodorow-Reich, G (2014), “The employment effects of credit market disruptions: Firm level evidence from the 2008-9 Financial Crisis”, The Quarterly Journal of Economics, 129(1): 1–59. De Ridder, M (2016), “Investment in productivity and the long-term effect of financial crises on output”, CESifo, Working paper series no 6243. Garcia-Macia, D (2015), “The financing of ideas and the great deviation”, Stanford University, Job market paper. Teulings, C N and N Zubanov (2014), “Is economic recovery a myth? Robust estimation of impulse responses”, Journal of Applied Econometrics 29(3): 497–514.